A browser offers options to modify menu bars and symbol bars as per the users’ requirements so that the on-screen space is utilized efficiently.While making modifications, you might accidentally hide the menu bar, due to which the settings become inaccessible. As long as the tab bar is visible,the menu bar can be reactivated quickly.If the tab bar is gone, you need to bring that back first. Right-click on the status bar and select ‘Modify bars | Appearance’ from the context menu. In the following box, activate the ‘Tab bar’ and confirm by clicking ‘OK’. You can then retrieve other menus from the list. If can become difficult if you have removed relevant symbol bars such as the status bar. In this case, you need to access the configuration file called ‘opera-prefs.ini’. First, close the browser. Open Windows Explorer and type ‘%AppData%’ in the address bar and push ‘Enter’. Look for the Opera/opera sub-folder. 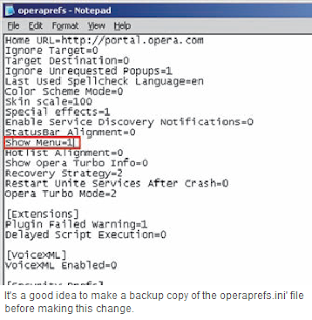 Now, open the file ‘operaprefs.ini’ using notepad. Search for the string ‘Show Me-nu=’, change its value to ‘1’ and save the file. Now, when you start Opera, the menu bar will be available,hence making other settings accessible.